Boaers anchor in a rocky cove on Summersville Lake. Photo courtesy Rick Burgess. Of all the bass lakes in West Virginia, there are five that the avid angler must add to his or her bucket list. Stonewalll Jackson is West Virginia’s premiere bass fishery. Only a short drive southeast of I-79 at Weston, West Virginia, this U.S. Army Corps of Engineer impoundment encompasses some 2,500 surface acres. Unlike other corps projects, it was built for recreation as well as water retention. The deepest channels in the lake were left timbered during construction to provide the habitat critical to producing trophy bass. A quarter century later, Stonewall Jackson has proved a bass hot spot. The W.Va. Division of Natural Resources maintains a catch-and-release-only program at the lake, ensuring a large population that produces many 4-6 pound largemouths. The lake’s pre- and post-spawn periods provides great fishing for trophy-sizes, however, early summer produces many daily creels by late morning. Late-season opportunities are not to be dismissed. They simply require savvy. Good parking is available at the launch ramp. Great camping facilities provide boat docks at some sites. Guest may soon stay in a nicely appointed lodge, complete with shopping and an 18-hole golf course. Plenty of lodging is available in nearby Weston. If you get excited about spending the day fishing shelves, river channels, and narrow coves, Stonewall Jackson is a can’t miss. Off I-77 south of Ripley, West Virginia, you’ll find a honey-hole called Woodrum Lake, built by the U.S. Soil Conservation Service to protect the flood basin of the Middle Fork Creek. It was also designed with the angler in mind. Though only 240 acres and with a small population, it makes up for by producing larger fish, with lunkers closing in on the 10-pound mark. Bring your arsenal, as the clear water provides a challenge. Because the lake fills a narrow creek bed, a 10-horsepower motor-limit is in place, with several no-wake zones. This protects the channel and structure that grows the big boys. Plan for self sufficiency. Campgrounds, restaurants, or filling stations aren’t common this side of Ripley 20 minutes north. If you feel the need for luxury, take a 30-minute drive south to Charleston, WV. 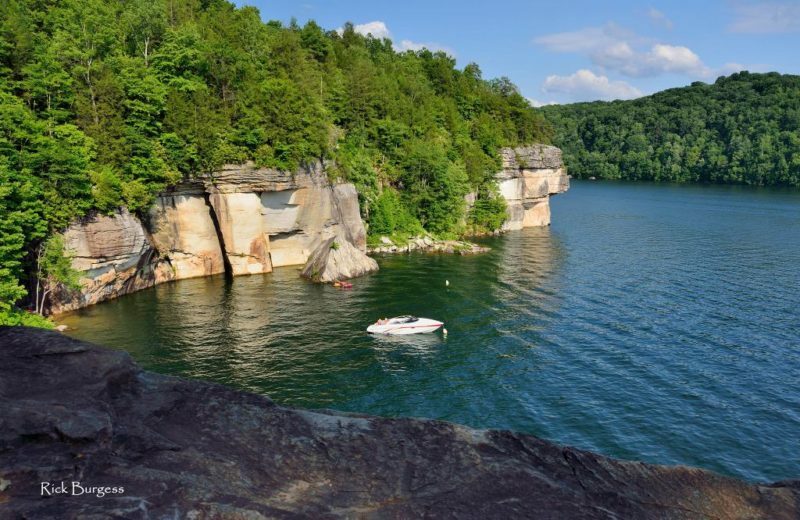 Primarily a smallmouth haven, Summersville Lake is the largest lake in West Virginia at 2,700 acres. Its shorelines range from shallow beachfront to coves framed by cliff. Fishing pressure in summer is light, but you’ll contend with large numbers of pleasure craft. Look forward to lighter traffic during the week. Fish stay deep and are spooked by heavy line in the relatively crystalline water, and be prepared to encounter deep and rocky shelves. Fluorocarbon line was made for Summersville smallies. In the southern end, near the Summersville Dam, crawdads and tube jigs rule the day. Out on the main water, subtle presentation of deep crankers and lightly colored spinnerbaits bring plenty of bass and the occasional walleye. Live minnows are allowed, and you’ll lose less tackle when you fish them, but lures are more productive when finessed to spooky fish. You’ll find plenty of camping, motels, restaurants, and shopping in the town of Summersville. There are also a couple of full service marine shops nearby. Moncove is wedged between mountains in the southeast corner of West Virginia, sheltered among low ridges and deer woods. It resembles the shallow, grassy fisheries of the South and Texas, but on a smaller scale. The lake, the centerpiece of Moncove Lake State Park is no more than 144 acres and a five-horsepower limit is enforced. Moncove boasts a pleasant campground for tents and trailers. If you’re equipped with a canoe or jon-boat, it’s a purist’s dream. Paddle through lillypads, grassbeds, stumps, and deadfall. Deep runners and stump jumpers pull them out of the thick vegetation. Spend your time drifting or trolling quietly on this little emerald, pulling trophies out of heavy structure to the song of cicadas at sunset. O’Brien Lake was built on the Bear Fork 10-miles north of Woodrum Lake. Borne of the same purposes, it is smaller, more narrow, a bit less productive, and is usually very cloudy. Yet, it is more accessible than Woodrum and therefore sees quite a bit of traffic.